AWS provides several managed services for file- and streaming-based media encoding options. Amazon Elastic Transcoder and AWS Elemental MediaConvert each provide several options for video/audio transcoding, optimized for various client devices. AWS Elemental Live provides online streaming-based encoding from edge camera devices. Through AWS Greengrass, edge devices can consume and encode video content at the edge and upload it to AWS for distribution or machine learning (ML) inference. Currently, these services offer up to 4K encoding. Recent developments and the growing popularity of 8K content has now increased the need to distribute higher resolution content. In this solution, you use an Amazon EC2 P3 instance to create a file-based encoding pipeline utilizing AWS Batch by first uploading a sample 8K (7680×4320) file to Amazon S3. The P3 instance comes equipped with the NVIDIA Tesla V100 GPU. The V100 is a 16 GB 5,120 CUDA Core-GPU based on the latest Volta architecture; well suited for video coding workloads. The largest instance size in that family, p3.16xlarge, has 64 vCPU, 488 GB of RAM, 8 NVIDIA Tesla V100 GPUs, and 25 Gbps networking bandwidth. Other than being a mainstay in computational workloads the V100 offers enhanced hardware-based encoding/decoding (NVENC/NVDEC). The following tables summarize the NVENC/NVDEC options available compared to other GPUs offered at AWS. Cinematic 8K encoding is supported using the Tesla V100 (P3 instance family) either in landscape or portrait orientations using the HEVC codec. For deployment, you containerize the encoding pipeline. 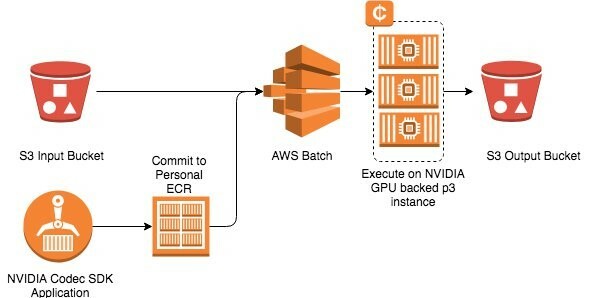 After building the underlying P3 container instance, you then use nvidia-docker2 to build the video-encoding Docker image, which is registered with Amazon Elastic Container Registry (Amazon ECR). As shown in the following diagram, the pipeline reads an input raw YUV file from S3, then pulls the containerized encoding application to execute at scale on the P3 container instance. The encoded video file is then be transferred to S3. This is a relatively lengthy procedure. 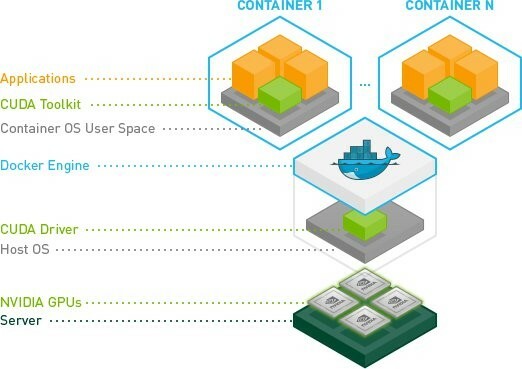 However, after it’s built, the underlying instance and Docker image are reusable and can be quickly deployed as part of a high performance computing (HPC) pipeline. The underlying instance can be built by selecting the Amazon Linux AMI with the p3.2xlarge instance type in a public subnet. Additionally, add an EBS volume (150 GB), which is used for the 8k input, raw yuv, and output files. Scale the storage amount for larger input files. Persist the mount in /etc/fstab. Connect to the instance over SSH and install any OS updates as well as the EPEL Release and support packages as well as the base docker-ce. The NVIDIA/CUDA stack can be installed using the cuda-repo-rhel7.rpm file. The CUDA framework installs the NVIDIA driver dependencies. Next, install nvidia-docker2 as provided in the NVIDIA GitHub repo. sudo sh -c "echo 'net.ipv4.conf.all.route_localnet = 1' >> /etc/sysctl.conf"
Ensure that the docker-container@ecs-agent service starts successfully. With Docker installed, pull the latest nvidia/cuda:latest image from DockerHub. Next, download the FFMPEG 4.0, nv-codec-headers, and the Video Codec SDK 8.1 from the NVIDIA Developer platform. 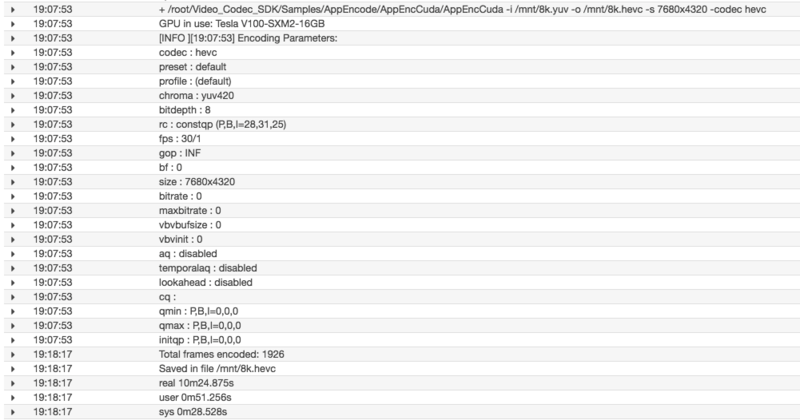 Download and extract the NVIDIA Video Codec SDK 8.1. The “Samples” directory has a preconfigured Makefile that compiles the binaries in the SDK. After it’s successful, confirm that the binaries are correctly set up. Create a small script to be used for the 8K-encoding test inside the Docker container. Save the file as /root/nvenc-processor.sh. In the basic form, this script encodes using a single thread. For comparison, the same file is encoded using four threads. Ensure that a Docker repo has been created in Amazon ECS. Choose Repositories, Create Repository. After you open the repository, choose View Push Commands. Commit the new created image to your ECR repo. Create an AMI from the instance, maintaining the attached EBS volume. Note the AMI ID. BatchServiceRole allows AWS Batch to call services on your behalf. ecsInstanceRole is specific to this workflow and adds permissions for S3FullAccess. This allows the container to read from and write to your S3 bucket. The following screenshot shows the example policy stack. In AWS Batch, select the compute environment and create a managed compute environment. Assign a cluster name and min and max vCPUs values. Use the AMI ID, and IAM roles created earlier. Use the Spot pricing model with a consideration of running at 60% of the On-Demand price. Look at the current Spot price to see if more aggressive discounts are possible. Note the cluster name. In Amazon ECS, you should see the cluster created. Next, create a job queue and associate this job queue with the compute environment created earlier. Note the job queue name. Next, create a job definition file. This provides the job parameters to be used including mounting paths, CPU, and memory requirements. Save the file as nvenc-test.json and register the job in AWS Batch. In the AWS Batch console, create a job queue assigning a priority of 1 to the compute environment created earlier. Create a job assigning a job name, with the job definition file, and job queue. Add additional environment variables for the S3 bucket. Ensure that these buckets and input file are created. Execute the job. In a few moments, the job should be in the Running state. Check the CloudWatch logs for an updated status of the job progression. Open the job record information and scroll down to CloudWatch metrics. The events are logged in a new AWS Batch log stream. A 1-minute 8K YUV 4:2:0 file took approximately 10 minutes single-threaded (top panel), and 58 seconds using four threads (bottom panel). 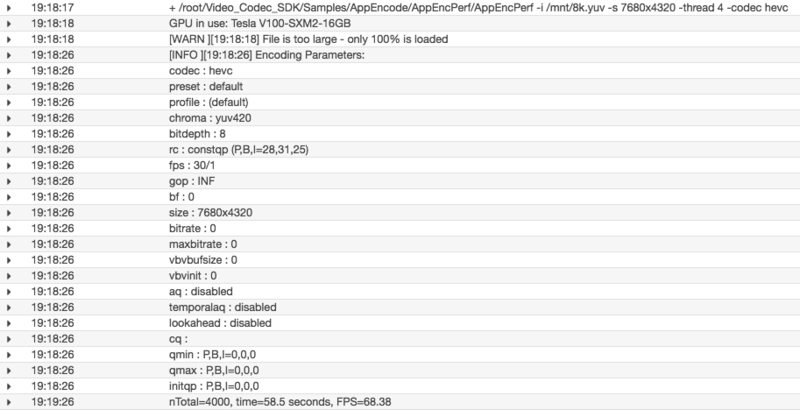 The nvenc-processor.sh script serves as a basic implementation of 8K encoding. Explore the options provided by the NVIDIA Video Codec SDK for additional encoding/decoding and transcoding options. With AWS Batch, a customized container instance, and a dockerized NVIDIA video encoding platform, AWS can provide your HD, 4K, and now 8K media distribution. I invite you to incorporate this into your automated pipeline. With some minor modification, it’s possible to trigger this pipeline after a new file is uploaded into S3. Then, execute through AWS Lambda or as part of an AWS Step Functions workflow.